NOTE: Are you going to be in the private investigation business for more than 5 to 7 years? Then consider this LIFETIME PERSONAL MEMBERSHIP plan. Never again pay annual union dues. Never again pay to renew your PI Union License. Always have passcode access to where the work is, where the hiring agencies are, and where you can obtain free marketing without paying for any advertising. LIFETIME PRIVATE INVESTIGATOR PHOTO CREDENTIALS), which includes an authorization for screening and the completion of your criminal records registration application. This $699.00 Package, includes LIFETIME Private Investigator Photo Credentials & Lifetime Personal Professional Membership. LIFETIME PI UNION PROFESSIONAL MANAGEMENT MEMBERSHIP . 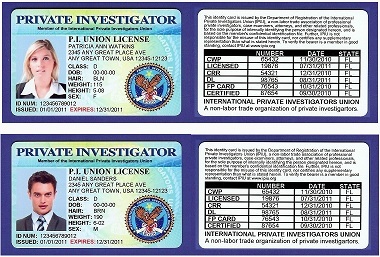 . .
PI UNION LICENSE (Private Investigator Photo Credentials). FREE Private Investigator Training Manual-Online Edition, and diploma. FREE Advanced Training Manual-Online Edition, and diploma. *You may upgrade this Personal Lifetime Membership to a Corporate Lifetime Membership for an additional $399.00. Lifetime Corporate Memberships include Sponsor help for your USA PI Agency License, but does not include other items such as setting up your c-corporation, agency insurance, or state application fees and other government costs.